We’ve gone back to checking the weather by physically going outside on to the balcony rather than checking our phones. When we went to turn on the morning news however, the tv wasn’t working. One email to DelSuites (rather than 2 days waiting for Rogers) and it was fixed. As I said though, tv isn’t much of a priority here. 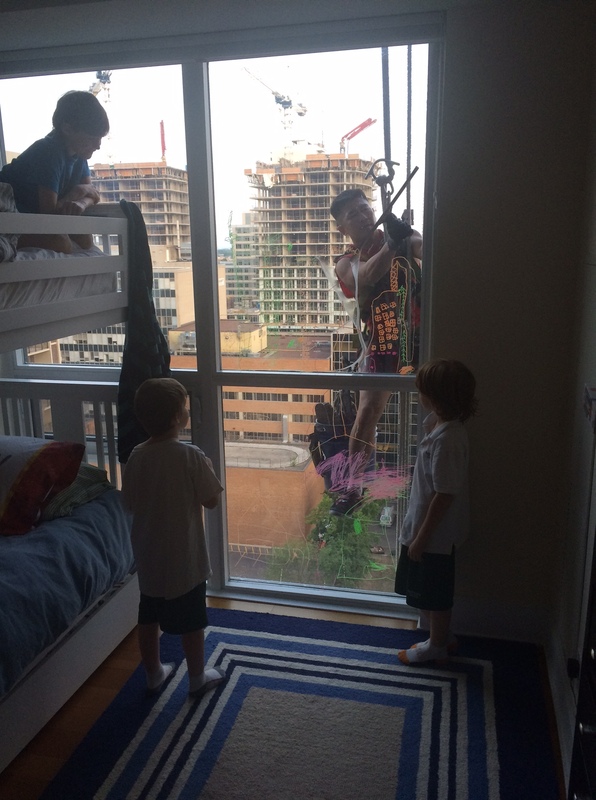 The view from the corner suite and floor to ceiling glass became their new canvas. A canvas that is bringing out the Picasso in them. Little architects in the making (I think). Here are some of the masterpieces. We were getting the hang of this. Out the door on time, a quick walk to get morning coffee, and two out of three made the school bus. My husband on the other hand, is doing much better with his keys and access devices. He now has everything (car, work, condo, house, garage, locker) securely on one key chain weighing about 3 pounds 🙂 and his friends are now asking if he’s ascending the condominium ladder and become the superintendent of the building. We returned home to have the highlight of the week. Window Washing. It was our own personal Spiderman. The boys got to watch him from both, outside AND in. He appreciated their artwork and reciprocated, delivering his own Picasso smiley on their bedroom window in exchange. That’s called karma. 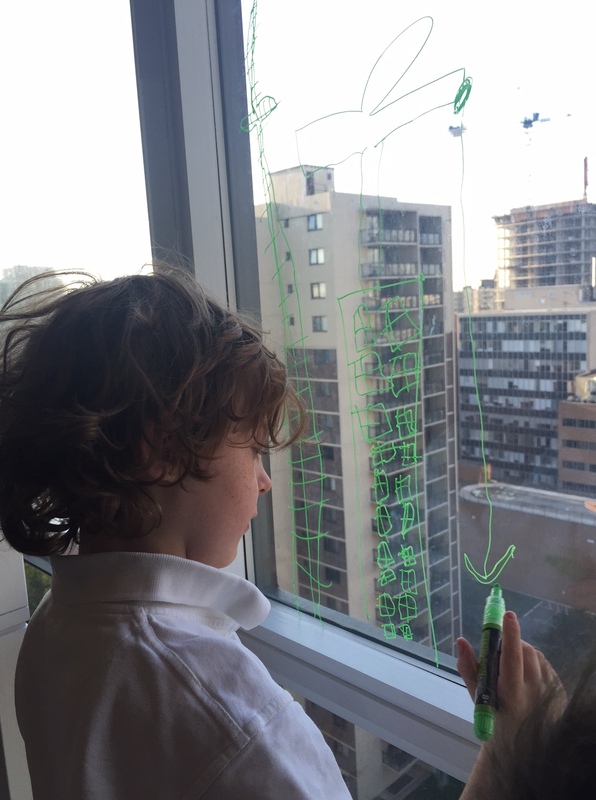 Turns out that seeing my boys art on the window was the highlight of his day. To see the full interview https://www.youtube.com/embed/KqOg4mLtz4s“>click here. Next Post Day 3. The honeymoon is over. Previous Post Day 5. Missing the backyard.